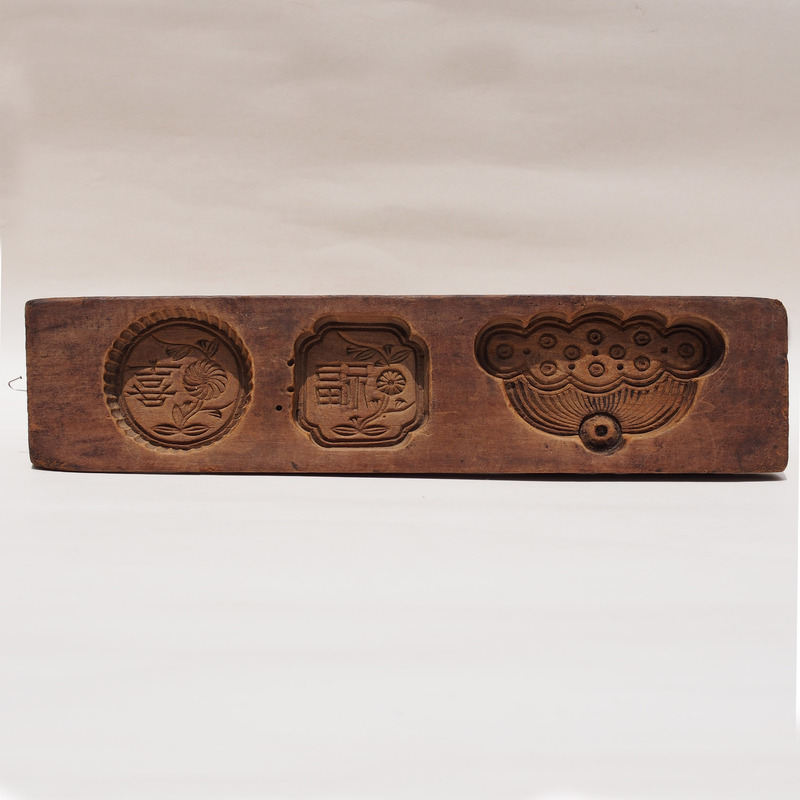 A Taoist wood block print entitled “Heaven Earth Dragon Carriage”. 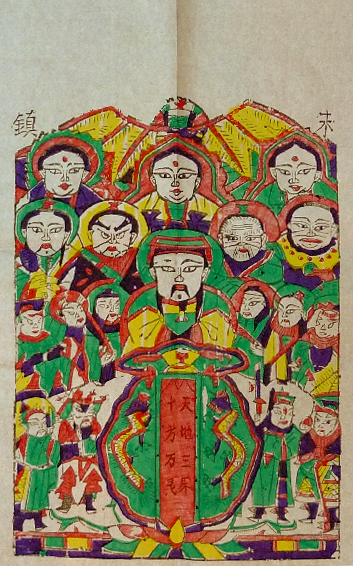 On the left of the print is Yuan Shi Tian Zun, the supreme Taoist deity, together with Tai Shang Lao Jun and Ling Boa Tian Zun formed the 3 Pure Ones. 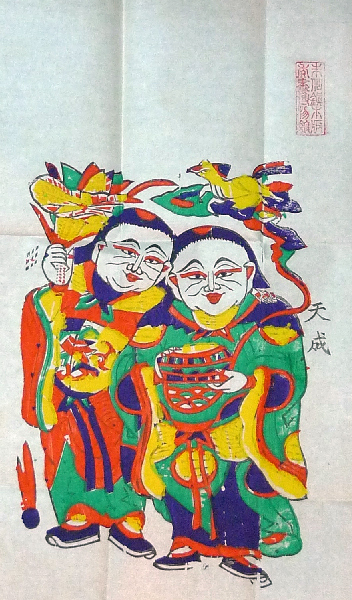 On the right of the print is the Jade Emperor, the God who creates the system of nature and the universe. 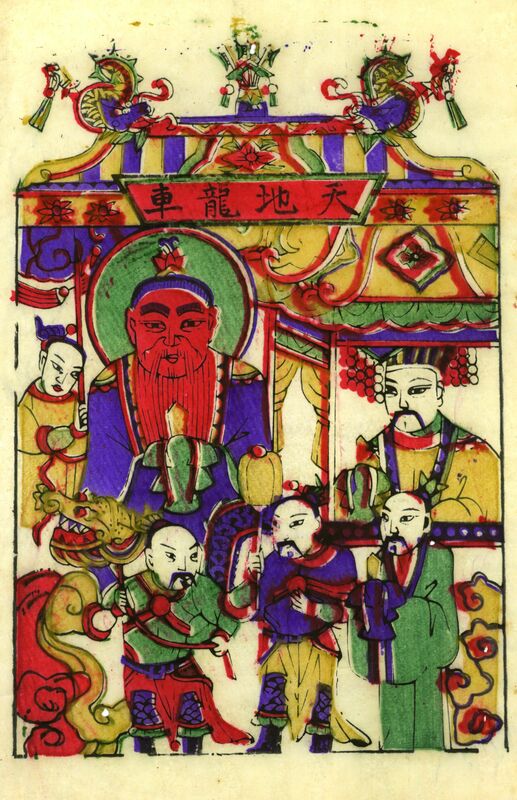 Jade Emperor sits inside his dragon carriage and around them the 4 guards; Wang Ling Tian Jun, Pu Hua Tian Jun, General Li, Marshal Zhao. 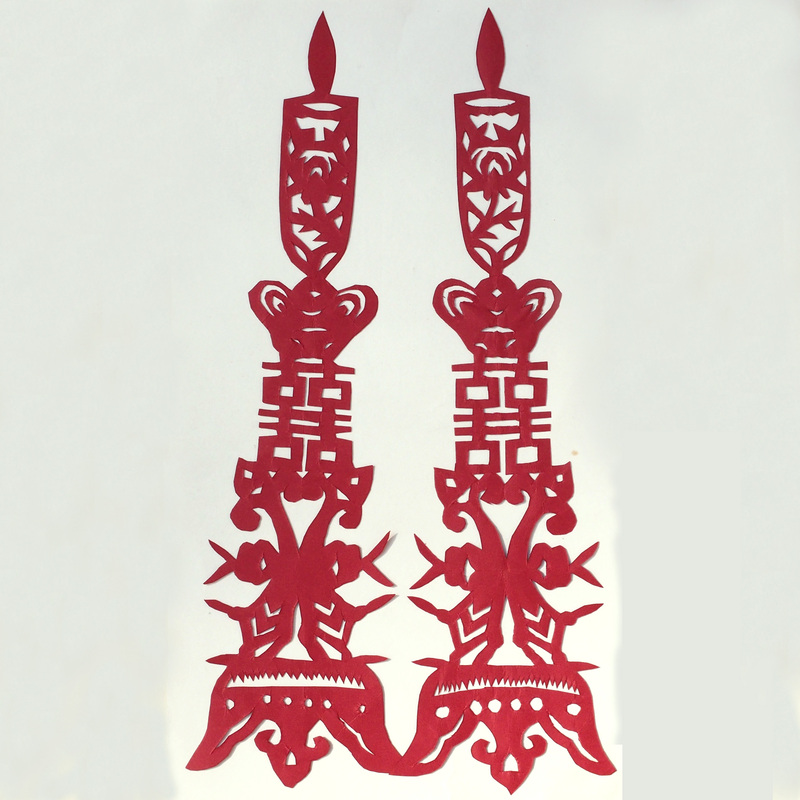 This new year print is used to bless of journey in vehicles, it is also used on the wedding day after the bride was picked up by the groom’s car, the couple would need to thank the gods for providing a safe journey. The word “bangle” comes from the Hindu word “bangri”, meaning a cylindrical ornament which adorns the arm. 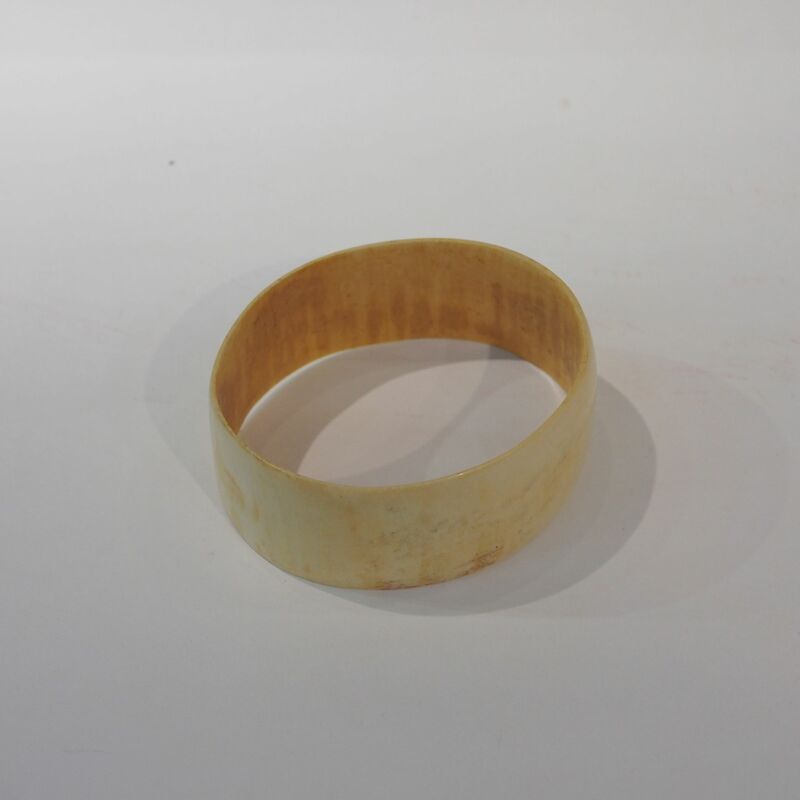 Bangle has the same symbolic meaning for Hindu as wedding ring has for the West. Married Hindu girls would have bangles round both of their wrists. 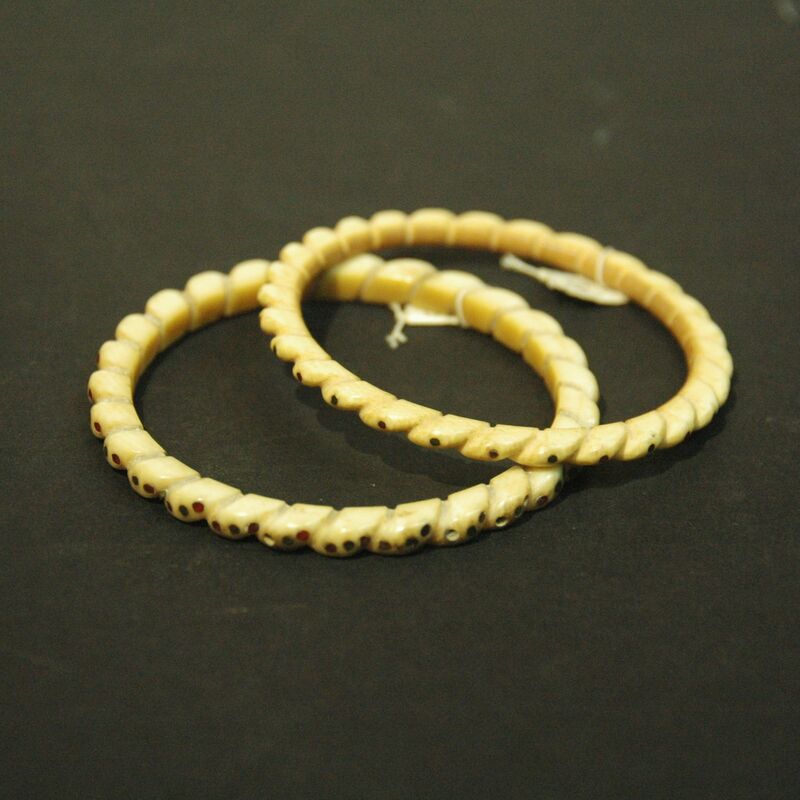 On the wedding day, the bride will try to wear a many choodi (bangles) as possible as it is believe that the honeymoon will end when the last bangle breaks. Maybe it is because the new bride is pampered and spared of the kitchen duty at the time when she is wearing the wedding choodi. The bride is expected to wear the wedding choodi for a year, a blessing for her in the new home. Choodi are made of different materials; gold, silver, glass, ferrous metal, conch shells and ivory. This is a pair of Shakha, a special sacred choodi worn by Bengali brides (also by Assames Hindus, Bodos and Santhals). These choodi are called shakha paula. Shakha, a white choodi made of ivory or conch shell and paula, a red choodi made our of red coral. On the wedding day the choodi would be dipped in turmeric water and put on the bride’s arm by 7 female (a symbol of goodness). The bride would wear these shakha paula signifying that she is married and belong to her husband, the choodi would only be taken off at the unfortunate time when she becomes a widow. Now how can I miss out the opportunity to play a Bollywood clip. 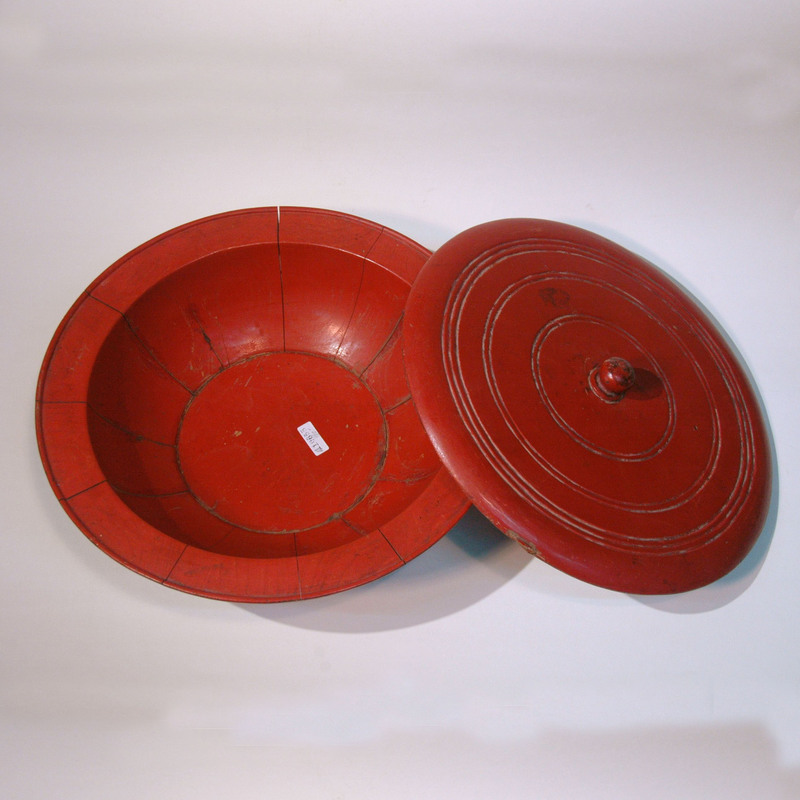 This red lacquer box is part would have been part of the dowry item in a traditional Chinese wedding. 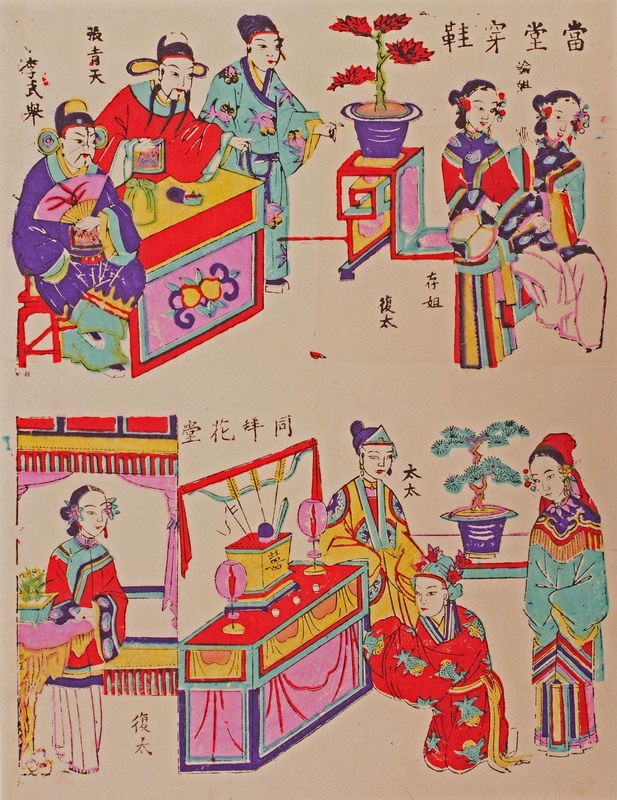 In old China when the country is agricultural based, male is regarded as asset to the family with their labour and sadly , especially for the poor, female took on a minimal role in society. It is said that a wealthy family their daughter is married off, a commoner’s daughter would be given away at the marriage and a poor man would have his daughter sold. Wary of how the daughter’s life would be when she enters the groom’s family, the bride’s family would try their best to come up with an elaborate list of dowry so to ensure the status of their daughter in the new home and that she would not be seen as “sold”. 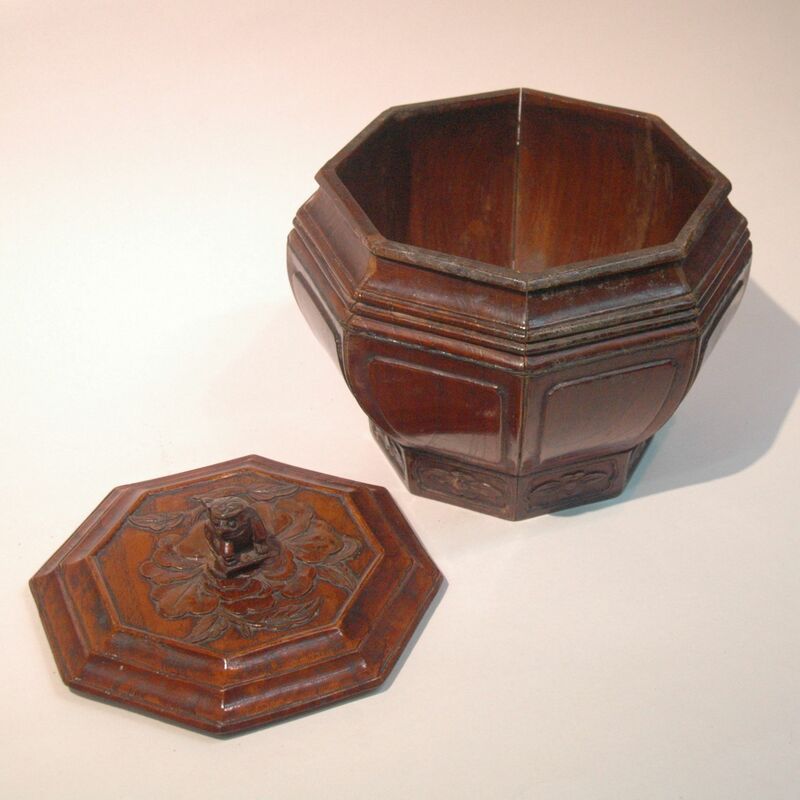 It so extensive that the production of the dowry would be categorized into wood work, carving work, lacquer work, box and bucket work and costume making. In the morning of the wedding day, a team would set out from the groom to the brides house, after noon time, the team would return with the bride and the dowry procession. For the riches, the dowry would be a full procession which goes on for miles. 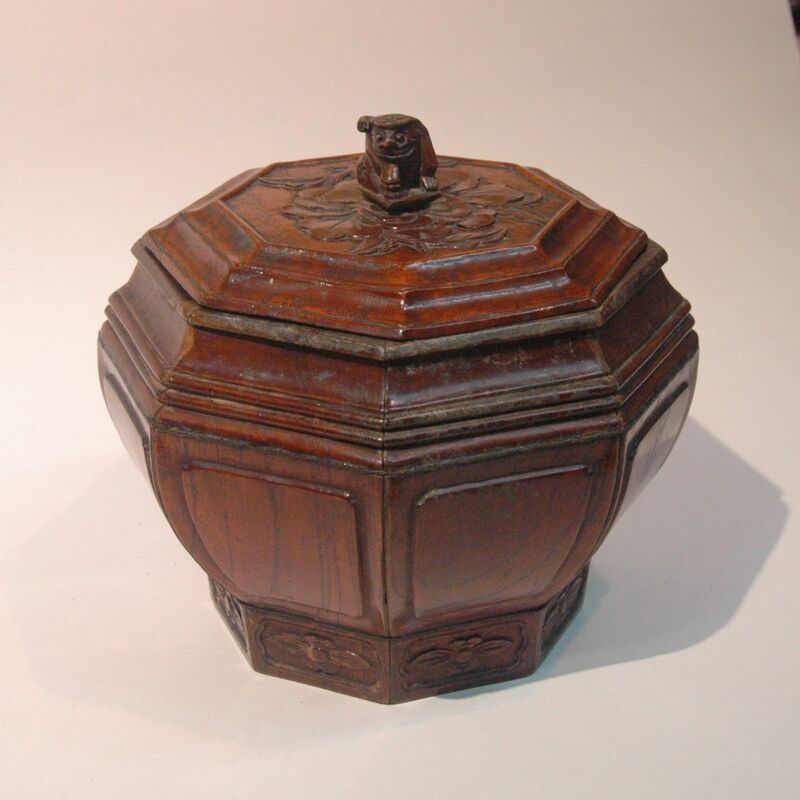 This lacquer box is for storing confectionery.